Commercial chain link fencing is a practical, economical solution for any business or commercial entity. Whether you are planning to build a prison, park, batting cage, or an industrial enclosure, Hohulin Fence offers high quality commercial chain link fencing products that can serve all of your fencing needs. All of our commercial chain link fence materials are made in the United States and come in different colors, styles and grades that can be tailored to accommodate the overall purpose of your fence. Commercial chain link fencing is particularly popular for athletic fencing for its protective, and relatively transparent, nature. Hohulin offers high quality outfield fencing and athletic fencing solutions, which enhance the safety of players and onlookers during games or practice. 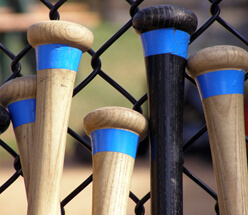 From outfield fence panels and chain link fence caps to windscreen material and low cost rolled barrier fencing, we have the right athletic fencing products to meet your needs! 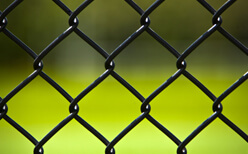 Learn About Our Commercial Chain Link Fencing Options! Get Your Commercial Chain Link Fence Today! Commercial chain link fencing is a durable, traditional option that will last for years. If you are considering purchasing a commercial chain link fence for your business, talk with our team of fully trained fencing professionals today. Contact us online or call us at 309-316-1008. For other commercial fencing products, please visit the following pages: Chain Link Fences & Athletic Fencing, Rental Panels and Ornamental Fencing. And for related commercial products, see our pages on Commercial Kennels, Highway Guard Rails, Commercial Gates & Operators and Commercial Railings.